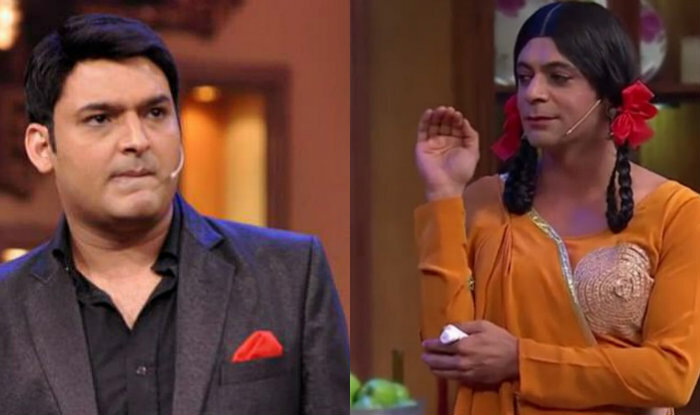 The first look of comedy king Kapil Sharma’s debut movie ‘Kis Kisko Pyaar Karu‘ is finally out. The makers of the movie has revealed the first look of the movie on social networking sites. 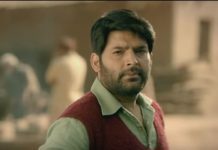 While the movie is in news for quite a sometime now because of Kapil Sharma’s debut, we must say that the first look of it hasn’t impressed us at all. The first look of the poster shows Kapil surrounded by four beautiful girls while Arbaaz Khan and Varun Sharma seems to be shocked on this. ‘Kis Kisko Pyaar Karu‘ is directed by Abbas-Mustan who are better known for producing and directing action-thrillers like Soldier, Baazigar and many more. This is the first time Abbas-Mustan are trying their hands in comic genre. ‘Kis Kisko Pyaar Karu’ also stars Elli Avram, Manjari Fadnis, Simran Kaur Mundi, Amrita Puri, Varun Sharma and Arbaaz Khan. The trailer of the movie will be unveiled on 13 Aug 2015. Produced by Ratan Jain and Ganesh Jain, the movie is slated for release on 25 Sep 2015. We wish all the best to Kapil Sharma for this one. 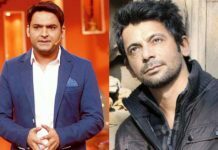 The movie Kis Kisko Pyaar Karu a akpil sharam is the first movie and First Look Revealed And We Are Not Impressed and While the movie is in news for quite a sometime now because of Kapil Sharma’s debut, we must say that the first look of it hasn’t impressed us at all. The first look of the poster shows Kapil surrounded by four beautiful girls while Arbaaz Khan and Varun Sharma seems to be shocked on this.